It was hardly a surprise when the new Botswana president, Mokgweetsi Masisi, was sworn in in April this year amid low public expectations. 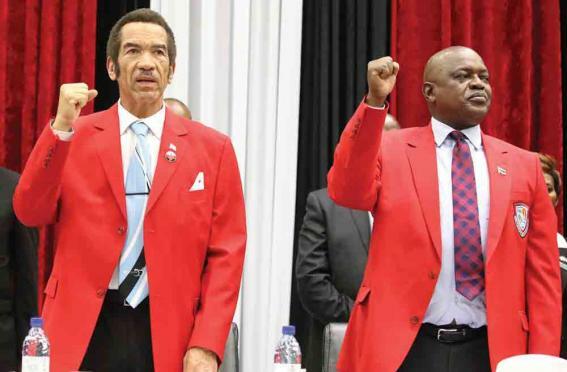 Masisi had been handpicked by outgoing president, Ian Khama, who ran the country for two constitutional terms with an iron fist amid rising cronyism, corruption,unpopular policies and unemployment. Everyone expected the new man to toe the line. Yet after being sworn in, Masisi has unleashed changes that were unthinkable a year ago, rewiring the presidency and moving to cleanse it of his predecessor’s autocratic legacy. He has steadily pushed the hands of the Khama clan from levers of power. Khama’s trusted security chief, Directorate of Intelligence and Security Services head Isaac Kgosi, was the first of key allies to be sacked in April. A piqued Khama reacted with a public display of anger. “Those who removed Kgosi never expressed concern about him [before]. He served this country with distinction for 40 years,” he said. Significantly,the outburst was made to a privately owned newspaper, The Voice, after the current administration refused to allow him to employ Kgosi as his private secretary. Khama no longer enjoys unfettered access to the state-controlled media. During his presidency Khama showed disdain for the private media, declaring it“shallow, boring … never contributing anything”, unpatriotic and partisan. In ten years he did not once call a media conference. Kgosi,his batman when he was head of the Botswana Defence Force, faces corruption charges, and Khama’s attempts to re-employ him as his private secretary miscarried when the Masisi administration refused to sanction the appointment. Khama’s allies are also in the crosshairs. Masisi reshuffled the Cabinet, sacking several ministers and redeploying others, and shook up the civil service. One prominent casualty was Roy Blackbeard, Botswana’s ambassador in London for 20 years, who was abruptly recalled. In 1998, Blackbeard resigned from his position as MP for Serowe North, making way for Khama who left the army barracks to become vice president under Festus Mogae. In exchange, Blackbeard was appointed “ambassador for life”. When he appointed his new cabinet, former land minister Prince Maele, a self-proclaimed die hard Khama loyalist, did not make the cut. Sadique Kebonang was also dropped from the Cabinet. Kebonang and Isaac Kgosi are both linked to the National Petroleum Fund corruption scandal, where high-ranking individuals have been charged with money laundering. For seven months, Masisi dodged questions about tensions with his predecessor. Then in a widely televised State of the Nation Address, he admitted that relations were so bad that he had sought the mediation of former president Festus Mogae and other ruling party elders, to no avail. Khama was not amused by Masisi’s openness. “The way you read it made to seem like I am the one at fault,” he said in a press statement. In part, Masisi is reacting to a worsening governance standards in Botswana under Khama. A corruption perception index report by Transparency International suggests some slippage between 2008 and 2017. Botswana is now fifth in the Ibrahim Index of Governance in Africa, down from the second spot in 2014. But there is a personal dimension to the feud: interviewed by the Sunday Standard,Masisi suggested that while he was vice-president, there were already plans to sack him. The flash point, he said, was Khama’s request for the appointment of Tshekedi Khama,the current Minister of Tourism, as Masisi’s vice-president, which he refused. There has also been conflict over what Khama considers his legal privileges and entitlements as former head of state. He remains a Lieutenant General. One issue was his request to continue flying military aircraft, which was rejected-in a memorandum by the BDF’s Air Arm Commander Seleka [Office1] Phatshwane to all camp commanders. In his interview with the Sunday Standard,Masisi insisted that use of BDF aircraft was not one of the rights of former presidents, and that it could only be decided by the serving president on a case-by-case basis. The feud took a nasty turn: in October the government withdrew five members of Khama’s support staff – the chief catering officer, a senior catering officer,a technical assistant, a senior administration officer, and a laundry attendant. Khama complained bitterly – again to a privately owned Weekend Post – that the situation was getting out of hand. “This needs legal intervention,” he said. The government later reinstated the five officers, with Masisi apologizing to Khama and giving an assurance of his full support for provisions of the Former Presidents’ Pensions and Retirement Benefits Act. [Office2] He is entitled to two state-funded support staffers, but now has three. In his few months in office, Masisi has also started to roll back Khama’s policy legacy. For example, he has cut the alcohol levy – introduced by Khama, a teetotaler, in 2008 to curb alcohol abuse in Botswana – from 55% to 35%. This hit the liquor industry hard, leaving many workers unemployed. In sharp contrast with his authoritarian predecessor, who disapproves of labor activism and independent journalism, Masisi has opened doors for dialogue with trade unions, and the media. One sign of the new openness is that Masisi has addressed two press conferences since April. Some analysts see the clash as an indication that Botswana’s political system is maturing. Political analyst Lesole Machacha argues that it is a positive reflection on the country’s democracy that leaders can disagree without“bloodshed, as happens in other countries”. However,Khama has refused to elaborate on his complaint that Masisi has gone back on certain agreements between them. “Nobody knows what is going on except the two men,” Machacha said. He added that Khama should also allow Masisi to lead the country without interference. He said that if the two men continue their public spat, it could hurt the ruling Botswana Democratic Party, with a general election just around the corner. Khama has shocked many with his public pronouncement that he still considers himself president of the BDP. The BDP secretary general Mpho Balopi maintains that President Masisi is the BDP president. The BDP Constitution states that “the president designate of the party [becomes] the party president upon the predecessor lawfully vacating that position”. Khama still has many supporters in the party, which could spawn factions and division. Apart from his hold on the BDP, the Khama family continues to exercise significant economic power in Botswana. ODC is managed by Marcus ter Haar, Ian Khama’s nephew. But the Khamas’ main source of economic influence lies in the ecotourism business. Tourism minister Tshekedi Khama, Ian’s younger brother, is seen to have been appointed to this portfolio to safeguard the family’s interests. Ian Khama has as take in Linyanti Investments, which owns the 1 300 square kilometre Linyanti Concession in the Okavango Delta. Khama’s lawyer,Parks Tafa, chaired the board of Wilderness Holdings, parent of premier ecotourism company Wilderness Safaris, for almost the entire duration of Khama’s term. Ter Haar is an independent non-executive board member. The recent widely publicised allegations of an elephant “massacre” in northern Botswana may have their roots in the struggle between Khama and Masisi. Masisi’s government drew fierce criticism from international conservation groups after claims that 90 elephants had been killed. Thea Khama,Tshekedi’s wife publicly blamed the e’ deaths on the government, saying they were caused by Masisi’s disarmament of the anti-poaching unit. Mike Chase of Elephants without Borders, who was given P4-million by the Khama government to conduct elephant surveys, told the BBC that the scale of the poaching was by far the largest he had seen or read about in Africa. But doubt was subsequently cast on the claims when the Masisi government took local and international journalists on a tour of the relevant area that came across 19 elephant carcasses.